← More Americans get their news from… Facebook? In journalism school, you’re taught that newspapers are the first draft of history. Today it’s common for news outlets to scoop themselves on their Web sites. But even that may not be fast enough when news breaks. 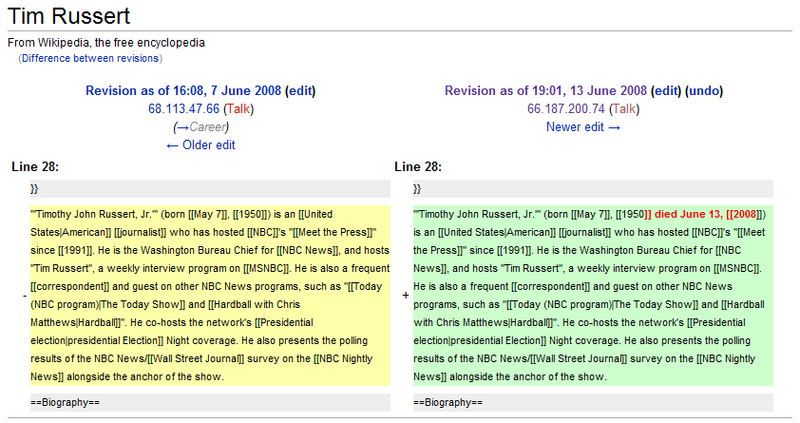 Lost Remote reports that news of Tim Russert’s death broke not on NBC or by a news site, but on Wikipedia. In the screenshot below, you can see the change made at 3:01 E.T., adding simply “died June 13, 2008”. I sent a note out internally in CNN in Washington to hold off. This is a story we’re not going to report first. And at the same time, the Fox bureau chief in Washington, Brian Wilson, and I had a quick communication. And we both sort of quickly said we’re not going to go first on this story. We’re going to wait for NBC to go on the air. We’re going to let Brian or Tom or whoever it was make the announcement, and then we would be ready to follow in. Not all of the media played along; the New York Times Web site reported the death before NBC. In fact, the Wikipedia contributions may have come from a journalist looking to get the word out. The original edit originated from an IP address belonging to a company that hosts Web sites for local TV stations. We’ll see more of this as publishing becomes easier and a wider audience becomes used to it. We’re just as likely to see news broken by a text message to twitter or a picture uploaded to flickr from a cell phone. Whether we believe it, or we like what we see is another matter entirely. This entry was posted in flickr, journalism, media, newspapers, television, twitter, wikipedia. Bookmark the permalink. This is amazing. I’m not a really young person and during my lifetime have seen the face of communication change drastically. Enjoy reading on your blog. Think I’ll blogroll you.